IN THE last hundred years, the Orlem area in Malad has seen steady growth and development. From being a small residential neighbourhood of 12 families in 1916, it has now become a bustling area with restaurants, supermarkets, educational institutions and soaring real estate prices. And through all this time, Our Lady of Lourdes Church, or Orlem Church, has been silently witnessing this growth. Built as a private chapel in 1880, by Father Joseph Braz D’Souza, in the area originally called Valnai, it was named after Our Lady of Lourdes. While in 1882 the chapel was affiliated to the church of Our Lady of Assumption, Kandivli, it was only in 1916 that it was given the status of a separate parish with Father D’Souza’s nephew Father Justin D’Souza becoming the first priest. 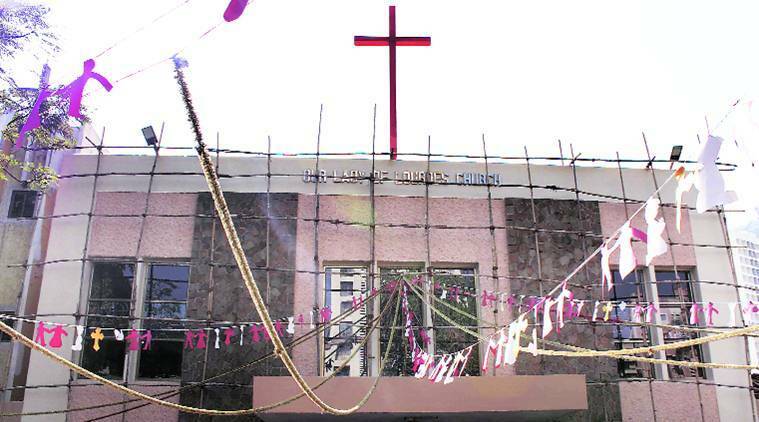 The current structure of the church was built in the late 1970s under the architect Raymond D’Lima’s supervision, who had also designed St Andrew’s Church in Bandra among some other important city buildings. Lined with wooden panels, the inside of the church is well-ventilated and brightly lit. Sunlight beams onto the neatly-arranged benches through glass paintings covering the windows. While all the paintings have different scriptural references, the one at the main entrance of the church depicts the apparition of Our Lady of Lourdes to a shepherd girl. In the courtyard stands the replica of the grotto representing the apparition. According to popular beliefs among the Roman Catholics, the Blessed Virgin Mary appeared to Bernadette Soubirous, a 14-year-old girl in the cave of Massabielle, a place near Lourdes in France on February 11, 1858. There were 17 other such apparitions that were reported through the year. While Soubirous was later canonised as a Catholic Saint, the church celebrates a mass in honour of Our Lady of Lourdes on the same day of her apparition every year and has marked February 18 as her Feast Day. From a humble beginning of 12 families during its origin, today the church has around 18,500 members making it one of the biggest parishes in the city. In Orlem, a school had also begun adjacent to the church, named St Anne’s School in the same year as the church. “Our church is one of the few parishes in the city where the church and the school began together,” says Father Gilbert Delima, the current church priest. Keeping up with the times, the school began offering international curriculum from this year onwards. “St Anne’s International School is the first IGCSE school affiliated to the Cambridge Board to be started by the Archdiocese of Mumbai,” he adds. Malad station, the closest railway station from Orlem, was also established by the efforts of one of the parishioners of the church. A letter documents the fact that Joseph Braz D’Souza, a namesake of the church founder, pioneered the movement to create the Malad station around 1916. As a fitting tribute in its 100th year, the church once again has contributed to the station by participating in the ‘Hamara Station, Hamara Shaan’ drive that worked towards beautification of 36 railway stations in Mumbai. “Continuing the legacy of the church, 250 members of the church, including adults, youth and children, participated in the drive to paint the Malad station,” says D’Lima. To mark a century of worship and service to the community, through the year the church participated in several outreach programmes with the objectives of fellowship, formation and service. As part of that, the youth will be soon visiting a leper home in the city to extend a helping hand to those ailing from the skin disease. With Christmas just around the corner, the church also has a lot planned for the coming weeks from night vigils, where the believers will participate in worship services all through the night, to carol rounds and midnight masses for Christmas and New Year.